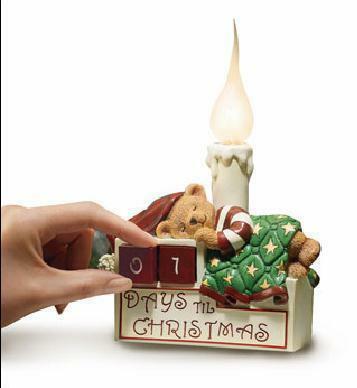 Countdown How Many Days Until Christmas Teddy Bear Lamp Description Let Everyone In Your House Knows How Many Days Are Left And Count Down The Days To Christmas!! Cute little bear is dressed up like Santa sleeping while is counting on you to countdown the days till Christmas! This desk lamp includes calendar blocks to count down the days, and features flexible flame-like light bulb and an on/off dial switch on power cord. It measures 8"H x 5 3/4" W x 2 3/4" D. Children and adults will enjoy manually changing the date using the blocks till Christmas day. UL listed for indoor use only. Made of plastic and resin. A unique Christmas gift idea that will last for many years! I have limited supplies, so get yours today before it is sold out!!! Brand new, never been used before. Payment and Shipping I accept Pay Pal. Please DO NOT send personal checks. Shipping Charges varies by buyer location. I will ship to the USA and world wide through USPS or UPS. I ship within 24 hours after receiving payment using delivery confirmation. Please feel free to ask questions about sale prior to its ending. I know you will love my items and my service. If you are not satisfied for any reason, please let me know so that I may work with you to make you happy. Please visit my current sales at Bonanza and save on S H with multiple orders. Thanks for your bid! Pay me securely with any major credit card through PayPal!